Remembering the first time I saw William Kentridge: it was in Chicago and I drove down from Madison, Madison Wisconsin with my girlfriend. I was around 21. I’m 35 now. I threw a temper tantrum while trying to find a place to park in the magnificent mile area. After parking, I remember looking into girlfriend’s big green eyes right after we got out of the car. She was looking at me so empathetically. “I’m going to dump you in a few months” she was probably thinking. She was just waiting for right exit. It’s not that I didn’t have good qualities then. I was full of charisma and passion but my passion was usually about art or skateboarding and I could be selfish in general. However, this moment at the MCA, seeing Kentridge’s work for the first time, was a moment in which my passion for art allowed me to be open to a beautiful world outside of me. “I’m going to dump you in a few months” she was probably thinking still waiting for right exit. The Kentridge Exhibit was at the MCA during the winter. I remember the weather being cold and feeling grumpy, even after my car was parked. I drove a long way get here (I thought to myself). I am so busy and have semester finals and I don’t have time for this (I thought to myself). I think that even then my hair was thinning. I can remember, or at least imagine, tufts of blond hair on top of my intense furrowed face blowing in the wind as my girlfriend and I walked up the steps to the museum—my hair and her planning their escape. My hair: “I’m going to slowly and politely leave out the back”. My girlfriend: “Ah, the fade away. Me too!“. We all (my hair, my girlfriend and I) entered the museum and got to the exhibit. The exhibit was a series of installation videos. 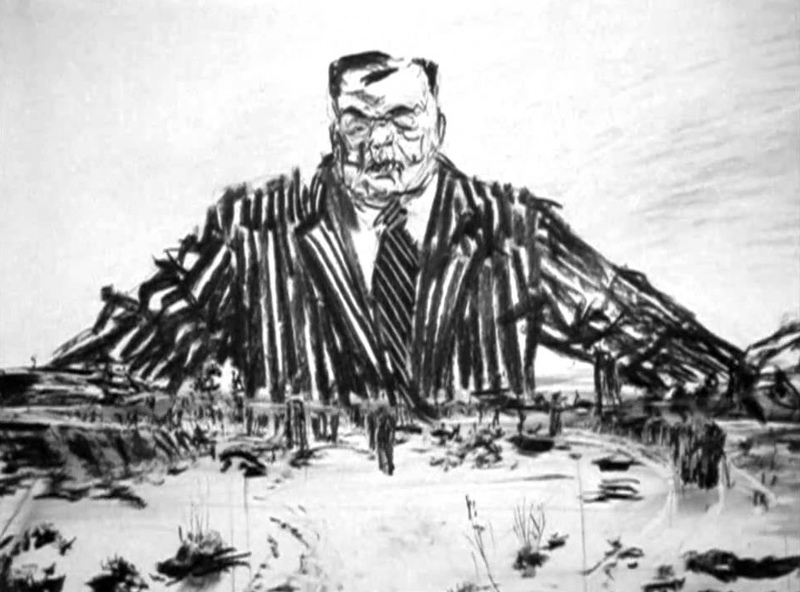 Each video was a narrative done in charcoal frames. manipulate the unset charcoal on that same piece of paper for multiple stills of the video. The result of his drawing process was that rest of the gallery space, besides the videos, were the beautiful drawings that he used for each video still. It was impressive. I loved Kentride’s confidence to make drawings and then change them. It takes a rare artist to be unafraid of changing work to further communicate a narrative. This is why I found this exhibit so exciting. As I was watching Kentridge’s short films which dealt with time and social issues in South Africa during that time I felt my intense heart getting soft. Kentridge’s sketches did more than demonstrate a deep understanding of space technically in his drawing style but also had feeling. It seemed to me that Kentridge wanted to have a point more than a beautiful sketch. My girlfriend looked at me, I had tears welling in my eyes. This is what I remember her liking about me—my ability to be there in the moment. I could just love something. I grabbed her hand and we walked around the museum together smiling with tears in my eyes (a common scenario for me still). I felt myself being curious about the world which Kentridge had created. The empathetic narrative in his artwork extended to me wondering about my girlfriend’s reality and her feelings. I’d been selfish earlier that day, throwing tantrums and being grumpy. We’d drove down from Madison together and she was taking the same semester finals as me at the same college. I had made the drive and the trip all about me. After getting dinner, we went back to Madison. It was business as usual, studying for finals and going to class. We didn’t talk much about those moments at the MCA. In general at that time I had an amazing gift of being a light hearted center of a party type of guy until I wasn’t. So we coasted until the semester was done. Those moments probably probably were in the front of both of our minds and but the furthest thing from words. My parents where diplomats and stationed in Albania at that time. When finals and the semester was over, I went and visited them in Tirana. I liked Albania. It has amazing fruit. The people were friendly to me and didn’t seem to be bothered by the fact that I was a character. One day, while in Albania, I went with a group of hikers down by the sea. There were fisherman fishing with dynamite at the beach we were hiking on. I got a call from my girlfriend on my Nokia Cell Phone (remember: 2000/2001). “Do you have time to talk?”, she asked. “Of course.”, I said; dynamite explosions happening in the background. “I’ve met someone; someone else”, she said, “I don’t want to be with you any more.”. At that moment, a dynamite explosion happened. Fish and fish guts flew into the air. I could hear the fisherman boys’ glee as they giggled near by. “I understand.”, I said to my girlfriend on the phone. “I don’t want to be with you any more.”. At that moment, a dynamite explosion happened. Fish and fish guts flew into the air. We, Emily (my girlfriend of that time) and I, talked a few times after that and not about us really. The conversations were more along the lines of: “Can I get this back?“. There was never much closure and there didn’t have to be. We were very different and I’d been a selfish boyfriend for the most part. I think fondly of moments I spent with her and I smile when I think of my first time seeing William Kentridge and getting dumped to the sound of fish being blown up with dynamite in the background (not about the fish being blown up specifically - I’m not into that). Years later, I did a series of work - fully embracing that eye opening situation and the new door to life that was accessed after seeing William Kentridge’s work.